Founded in 2010, PUBLIQuartet boasts a résumé that any rising traditional string quartet would envy: a Concert Artists Guild award, residencies at the Banff Centre and the Metropolitan Museum of Art, and performances at the Kennedy Center and Lincoln Center, among many others. But this group – violinists Curtis Stewart and Jannina Norpoth, violist Nick Revel, and cellist Amanda Gookin – is anything but traditional. Known for genre-crossing arrangements that often incorporate elements of improvisation, PQ has played at the Detroit and Newport Jazz Festivals and Dizzy’s Club Coca-Cola at Jazz at Lincoln Center. Famously, the group improvised a live soundtrack to the final 2016 presidential debate for The Late Show with Stephen Colbert, which was broadcast simultaneously on Facebook Live. Last month, the ensemble received the 2019 Visionary Award from Chamber Music America, which applauded its mission to “…employ traditional instrumentation to tell urgent and engaging stories about our modern world, drawing in new audiences and showcasing voices and sensibilities rarely heard on the classical concert stage.” In accepting the award, the group chose to play “Bird in Paris,” a mash-up of Charlie Parker and Debussy that showcases the improvisatory skills central to their trademark MIND|THE|GAP program, in which they adapt music ranging from the Medieval period to pop standards. For the past four years the quartet has also supported contemporary composers with PUBLIQ Access, a commissioning program. This season PUBLIQuartet is in residence at National Sawdust, where it is showing off all facets of its practice. On Feb. 10, PQ performs a new program, “Freedom and Faith,” celebrating a millennium of female composers with familiar names such as Hildegard von Bingen and Nina Simone, forgotten figures like 17th-century Italian composer Francesca Caccini, and new voices including Shelley Washington and Jessica Meyer—who both participated in PUBLIQ Access. 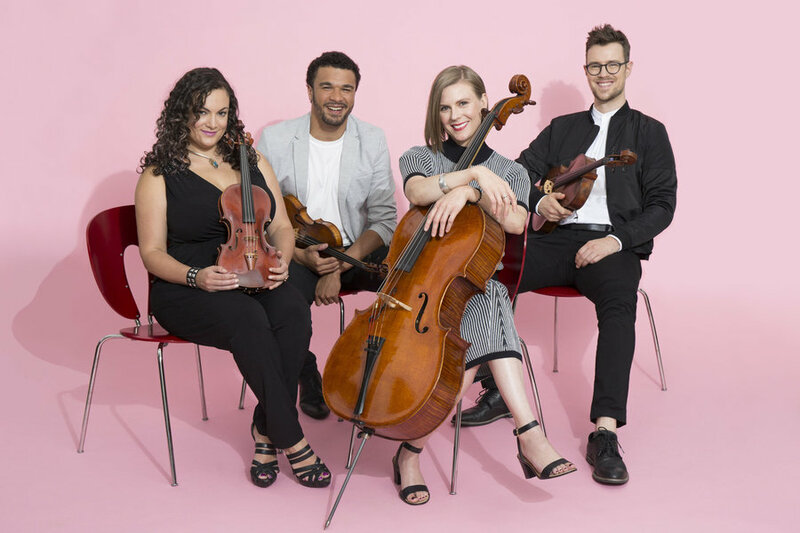 National Sawdust Log sat down with founding cellist Amanda Gookin on a rainy afternoon in Manhattan to discuss the group’s new album, its National Sawdust residency, and its commitment to supporting a diverse range of voices. NATIONAL SAWDUST LOG: Freedom and Faith is PQ’s second album and your first in four years. What was its inspiration? AMANDA GOOKIN: This album actually sprung from a PUBLIQ Access program. Last year we commissioned three composers to write pieces for us through PUBLIQ Access, and we curated three different concerts centered around those works. There was a work by Steven Snowden called “Silent Sentinels,” and it was to honor the suffragettes who were brought to the Occoquan Workhouse in November of 1917. His piece commemorated the 100th anniversary of the night when they were dragged to prison and beaten. They subsequently were there for a very long time and force-fed. [The Workhouse] has now been turned into an arts museum… it’s called the Workhouse Arts Museum in Lorton, Virginia. I was really trying to get a concert there—I wanted to premiere that work at the site on the anniversary. We performed works by Lili Boulanger, Ella Fitzgerald, and other composers who were born around that time. And we premiered [Snowden’s] work. Then we curated another program around Jessica Meyer’s piece called “Get into the Now,” which was co-commissioned by Washington Performing Arts, and we performed the “Freedom and Faith” program there. We arranged “Sancta Femina,” which has arrangements of Hildegard von Bingen and Francesca Caccini; we premiered Jessica’s piece; we premiered a former PUBLIQ Access piece by Jihyun Kim called “Extempore Anamnesis;” we did some works by Pauline Oliveros, so it was a female-centric program. It was centered around the idea of what it means for a woman to use her faith, to have faith in herself, to have faith in a higher power, to push through oppression, and the freedom of artistic expression. When you think of somebody like Hildegard and other women of that time, they could only be musicians if they were nuns, and even then, it was pretty selective. She would say she didn’t write music, that God wrote music through her—which might be true, but also really she deserves the credit. And a lot of her music was about female icons, not just male archetypes. She was a feminist in her own right, and an amazing woman. How do you research the work of someone like Hildegard von Bingen, who lived more than 900 years ago? A lot of manuscripts exist still. She was published; she wrote a book, Physica, which is writings of herbalism. A mystic, a scientist—she was incredible. She also wrote a book based on the visions that she had, which are speculated to be migraines, but she would have very strong visions, so she wrote them all down. She documented everything. And there’s also a really great organization [the International Society of Hildegard von Bingen Studies]. It’s a foundation meant to keep the works of Hildegard alive and the conversation going. It’s an enormous resource and the people who run it are just passionate about Hildegard. Her scores are up there, resources to peer-reviewed academic articles of her life. She’s very well researched. Other woman, not as much. In putting together the Washington program, did you have the idea that this would become a larger project or an album? I had hoped. When we put together creative programs, they end up touring—we offer them to other presenters. So a lot of the programs that were created for the Met residency ended up being programs that we performed at many other venues. I should also mention that there was another [PUBLIQ Access] composer and her name was Xian Wang, and she wrote a piece based on Edgar Allan Poe and birdcalls and going mad [“Nevermore”]. And that was premiered here in New York at a really awesome new music venue in Greenpoint called Areté. So when we were deciding on the album, there were a couple themes in mind. What were some of these themes? Two major themes that were in the running were our “What Is America” program – which features a rearrangement of Dvorak’s “American” String Quartet, works by Jessie Montgomery, and it might have included some other commissions – and another idea we had floated around was just an album featuring our MIND|THE|GAP compositions. “Freedom and Faith” seemed the most fleshed out and the most timely. Very timely in terms of the broader cultural moment. Did the conversations around #MeToo come up as you were charting out the album? Supporting women has been a necessary step in our careers—in every musician’s career. I’ve been doing [Forward Music Project] for a while, and I feel very passionate about the subject, and I know that everyone in PUBLIQuartet does as well. We had been talking about creating the album for a year – it takes a while to make a big decision like that – [“Freedom and Faith”] just made the most sense. And the #MeToo movement affects the larger conversation that we’re involved in. I don’t think that it’s really referenced specifically, but it’s definitely a response to all these changes that are coming around. We talk about female composers not getting their due, but there is a lot of literature out there to choose from. So even if I say Clara Schumann and Fanny Mendelssohn – it sounds classical, it sounds traditional – there’s the idea that people are still not going to want to attend the concert. And that’s a huge misconception. Give people the benefit of the doubt: I think if you actually tell your audiences what you’re doing and why you’re doing it, they’re going to want to experience something like it. We have Ella Fitzgerald, Nina Simone, and the early female composers: none of that stuff was written for string quartet. Yes, there are less traditional string quartets [by women than men], but PQ doesn’t play traditional repertoire. We want to play music that is of the traditional era, but in our own way. So we rearranged a lot of these for the group, and then arranged works by Nina Simone and Ella Fitzgerald for quartet. Shelley Washington’s “Middle Ground” was already written for string quartet, and Jessica of course wrote for us. But everything else that’s on the album was not for quartet. What is your process in writing these arrangements? PQ does them as a group. Usually the way it happens is someone brings an idea of the composer they want to arrange. They come with a roadmap of their creative ideas, and then it’s fleshed out and collaborated on in the group. So the artistic integrity of the person who originally brought it for the MIND|THE|GAP arrangement is intact, but it has an organic feel that the whole group participated in the process of music making. Improvisation is important to your practice. Where does that come into play? A lot of it is improvised because most of our music is not written down, so we have to constantly play off the page. Nothing is prewritten like a traditional score. So for instance, “Sancta Femina,” the first number on the program, you will not be reading off a score? Hardly. There are notes that we are reading on the page. Hildegard’s scores are monophonic, so it’s just one line of a vocal score. We are reading those notes on the page, but the way they’re organized is not on the page. We all write in written instructions so in those scores we are reading notes that are written by those women but in a different way. For example, in a score for Ella Fitzgerald there are no notes; its all written instruction. “A-Tisket, A-Tasket,” everybody knows that theme, it’s not hard to recreate. It’s “play bass line here,” “do percussive stuff here,” and then we flesh out those instructions. Curtis is actually the one who brought it to the table. Anyone walking in and looking at [our scores] for the first time would not understand what we’re doing, but I kind of think that’s what makes it special. Did you go in knowing that you wanted to check off certain boxes or include certain voices or themes? Demographics are important. Unfortunately we can’t, on one album, represent every single face of America, so maybe there will have to be a Freedom and Faith Part 2, 3 and 4. But we did our very best to represent a diverse body of composers, as well as musical styles. When did improvisation become a cornerstone of the PUBLIQuartet? We started it about two years into our existence with [violinist and composer] Jessie Montgomery, who is one of the original founding members of PUBLIQuartet, when we were at the Banff Centre in Canada. At the end of the day we would grab some beers and go into a practice room and improvise, and try to imitate recordings of pop songs and other pieces of music that we really liked. It was just an organic process. Did you think these sessions would go anywhere? No. We didn’t think that it would go anywhere until we did a combination of Haydn and Schnittke for the other coaches and attendees of the chamber music festival. It wasn’t until we received their reaction, which was so positive, that we were like maybe we should continue to do this. Through the years we’ve written many more. It didn’t take a long time to actually learn how to collaborate with each other, and our individual creative voices are growing and changing and therefore that effects how our MIND|THE|GAPs have evolved over the last seven years. 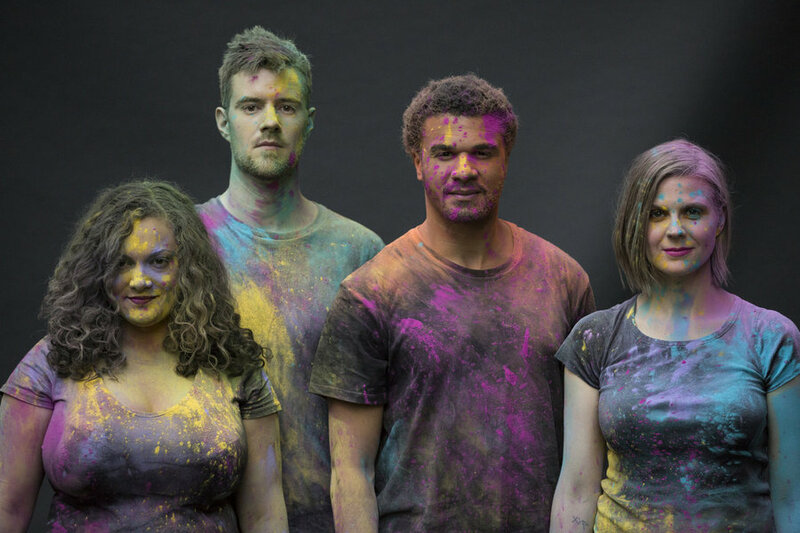 How did you develop your National Sawdust residency? I applied to a residency with PUBLIQ Access in mind, so the original application for the residency was to incubate and workshop new PUBLIQ Access works and premiere them. When the offer came in, we started talking about using our residency to our benefit and curating more concerts as a part of our larger artistic mission. “PUBLIQ Access” is premiering in April, and we’ll be workshopping through the spring with the composers in the space. We added on a concert [last] fall of music by Andy Akiho, and for February, we wanted to do a concert centered around the album. We went in that direction because it sort of spans all the things that we like to do. What was the biggest discovery or surprise for you when creating your album? I think we found new sounds. We are always were pushing the envelope, I love extended techniques outside instruments, incorporating different styles and our own bodies. We don’t try to literally replicate what a composer is doing; we take what they’re doing as inspiration, and authentically build our own response to that. For example, with the Nina Simone arrangements, some of the stuff from “Blackbird,” there’s a talking drum in the recording and also hand clapping. And so I figured out how to replicate that sound on the cello as best as I could. But for other things, we sort of took the song apart and did our own response to it. Especially “Mississippi Goddam”—it’s the same vibe, but we have our own spin. As a string quartet you can’t replicate something like that, so you have to figure out a way by creative process. Last month, PQ was honored with the 2019 Innovation Award from Chamber Music America. What does this award mean to you? Good question… I guess we’ll find out. But after nine years of such hard work and uncompromising programming and so many ups and downs and sticking it out, being recognized by what was known as a very traditional organization… CMA is making a lot changes, and really taking a step into the future, and it’s so admirable. It’s just a sign that things are changing that groups like ours or eighth blackbird or Jon Batiste are recognized for innovation in the field. Finally, we feel like we matter and have a voice and are influencing the field in bigger ways than we ever could have imagined. So it was incredibly meaningful and when we received the award it was a wonderful night. Amanda Angel is a New York-based journalist whose work has appeared in The New York Times, Time Out New York, and on the websites of WQXR and ESPN. She can be reached at amandaangel81@gmail.com.